Trendy Colors: Choose Paint Colors for Easton Home Interior | Boss Services Inc. Trying to choose a paint color for home remodeling or updates can be challenging. There are literally thousands upon thousands of choices available. 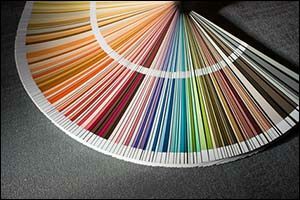 In addition to colors, you also need to think about finishes, such as gloss, semi-gloss, eggshell, matte, flat and pearl. Working with Boss Services in Massachusetts can help provide access to top name brands for materials, such as Benjamin Moore, Olympic and Sherwin-Williams residential paint. It can be helpful to check out color trends before you start working with one of our agents to choose the best paint for walls and trim. Quality paint in Easton should be your first priority. Color trends can be exciting, but it is also important to make sure you don’t get too trendy with your wall colors, especially if you are planning on selling or renting out your home anytime soon. What might seem like a perfect hue and shade to one person, isn’t necessarily a good choice for another. Boss Services in Massachusetts can help you make a smart choice. Believe it or not, 2016 is being dubbed the “Year of White,” due to an overwhelming interest in pure white shades. Some of the top paint brands in the business, including Sherwin-Williams residential paint, are catering to this trend by offering bright, white colors for kitchens, bathrooms and other parts of your home. A classic color, you can’t go wrong picking a white or even off-white paint for your painting project. Clean, white kitchens have been a trend for a while now, and the popularity doesn’t seem to be slowing. White bathrooms with a splash of color accents, can help to reflect any number of style tastes and designs. Another popular trend this year is several variations on the color blue. From a classic navy to a dusty blue-gray, homeowners are using this color throughout the home. Bathrooms, bedrooms, living spaces and kitchens can all benefit from the pale, icy and baby blue trends that have hit the painting industry. Shades of denim and teal are also popular, working as both accent colors and main wall hues. An excellent color for a home office, blues are also very popular colors for bathrooms and bedrooms. Just make sure you choose quality paint in Easton in your favorite color. For several years, variations on the color gray have been trending. An excellent choice to use with the popular whites and blacks of this year, gray can be used in bedrooms, kitchens, bathrooms, and just about any room in the house. Check out the gray options with Sherwin-Williams residential paint and other quality paints in Easton. Great for outdoors as well, used frequently in patio furniture, deck areas, and other types of outdoor living spaces. Another popular color trend this year is variations on green, including a leaf green, emerald-green and dusty gray-green hues. If you are going to choose a paint color for home interiors, green is a good choice, however it is also good for trim and other accents, as well as decor items, including throw pillows, rugs and window treatments. Unique shades of green are available from brand name paint companies used by Boss Services in Massachusetts, including Benjamin Moore, Olympic and Sherwin-Williams residential paint. This year’s metal is gold and copper. Vibrant metallic and yellow gold shades are very trendy in home decor and for quality paint in Easton and the surrounding area. Used sparingly, gold makes a nice accent. However, it can be used on entire walls, including bedrooms, bathrooms and even in some kitchen designs. Copper can be a beautiful accent color and can even be used as a focal point wall when combined with other hues. Softer shades of purples and pinks, in particular dusty hues, such as mauve and grayish pink, are also popular this year. Lavender, bold purples and pastel pinks, as well as deep plums and bluish purples, are also great choices. Use for bedrooms, accents in bathrooms, and decorative items. Sherwin-Williams residential paint options available in these colors can really help you to make a statement. If you are looking to choose a paint color for home walls, contact Boss Services in Massachusetts, to speak with one of our design experts. We can help you select the best quality paint in Easton and the surrounding area. Our team has many years of experience working with residential and commercial clients in the New England region, and can provide you with top quality services that will help you to achieve your color and painting goals. Call today at 508-297-0635 for a FREE estimate on your next home design and remodeling project.